Red Sonja is probably the poster child for the fantasy heroine with the heaving cleavage, and I was interested to see whether that particular aspect of the character would continue as comics move ever so glacially towards a less exploitative approach. To start with, this story sees Sonja in a fairly restrained mode, seemingly without a role in a Hyrkania apparently bereft of violent threat. This results in her thinking back to her former adventures and carnal conquests with longing, and the sensuality of the character is evidently still an important part of this arc – even though it’s made more than clear that Sonja’s passions are her own and she is no man’s plaything. Of course, things don’t stay peaceful for long, with Sonja soon having cause to unleash her sword – and that’s pretty much where this issue leaves us, right at the start of a new adventure. 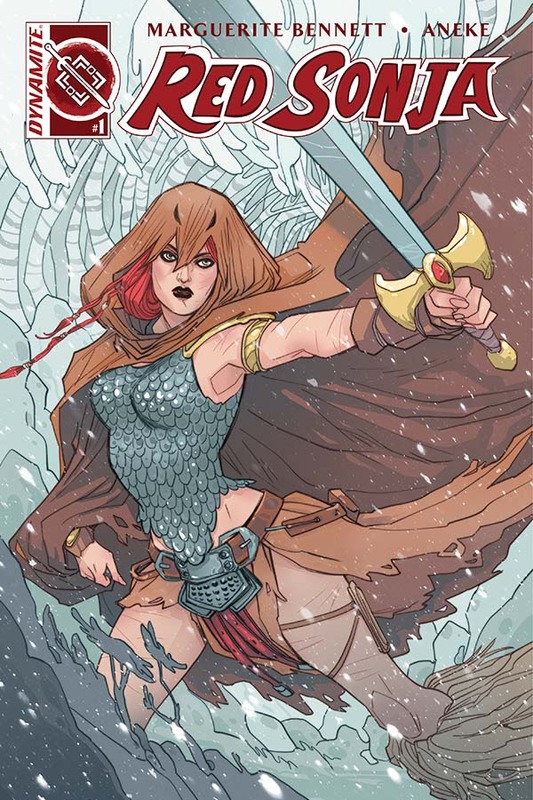 The flashbacks and slow build to the twist where the story arc really kicks in make this an excellent jumping on point for Red Sonja as the character is introduced in a way as to make her compelling to a brand new reader. Also, it’s helpful that this appears to be a story which doesn’t rely on a knowledge of past adventures. Aneke’s artwork is lovely, painting a lush and colourful picture of this fantasy universe and conveying a sense of movement and dynamism which is often rare is a comic which uses such clean lines. The way Sonja’s emotions are captured is especially impressive, and an important part of what makes this book so effective. All in all, this isn’t exactly reinventing the wheel, but the archetypical fantasy heroine is undoubtedly in good form. Its me or the art looks a little bit cheessy for Red Sonja? I mean, I get it in the store and was like new Barbie girl adventures. (Even with the new chanmail). Yeah, well, I´m a man and all the time looks like the comic and Sonja´s style it´s not for me. I´ll follow the new series of Belladona waiting for a new Sonja´s team, Edson Novaes was great for example. Benett does a great job with Bomshells, (still doing), but I do not like Aneke and the way she doess the new faces. Before she was better. The expressions get strengh. Now is detailess and one like the others. IImn this issue the color improves her line, but Im not gonna buy it. Read my coment above, Grant. Did you read Insexts from Bennett? I also good. You convince me, the problem are the pencils (but the coour is great).